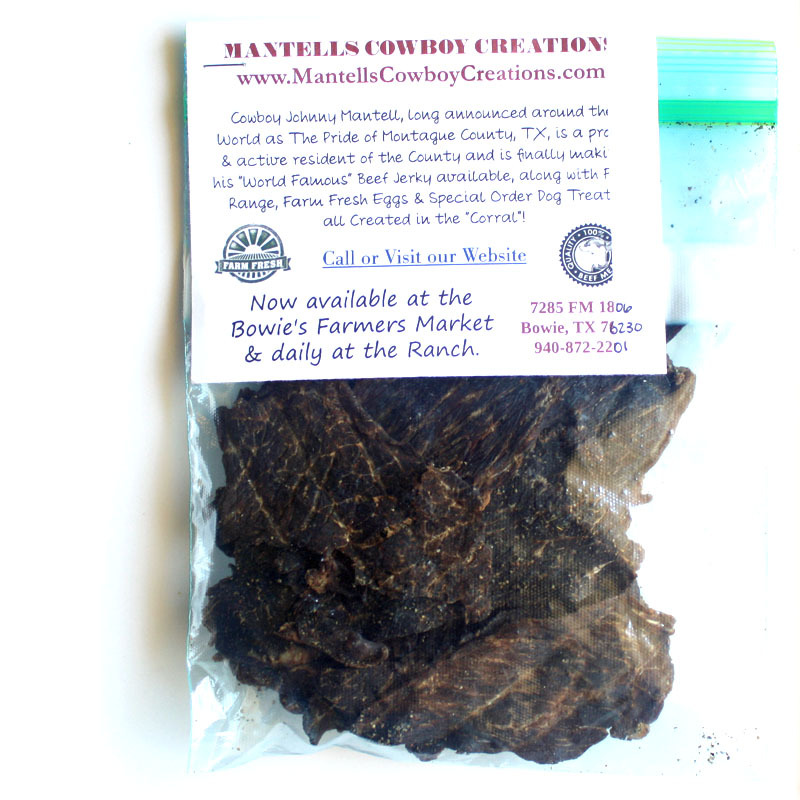 Mantell's Cowboy Caviar is a line of beef jerky produced by Mantell's Cowboy Creations of Bowie, TX. Mantell is better known as "Cowboy Johnny Mantell", or, "The Pride of Montague County", of professional wrestling fame, and currently runs wrestling training and seminars at his "Mantell's Corral". The Mantell's Cowboy Creations brand produces all natural and farm fresh foods from Mantell's own ranch, including farm fresh eggs, fresh produce, and special order dog treats. He currently sells his products at Bowie's Farmers Market, wrestling shows, as well as through his website. 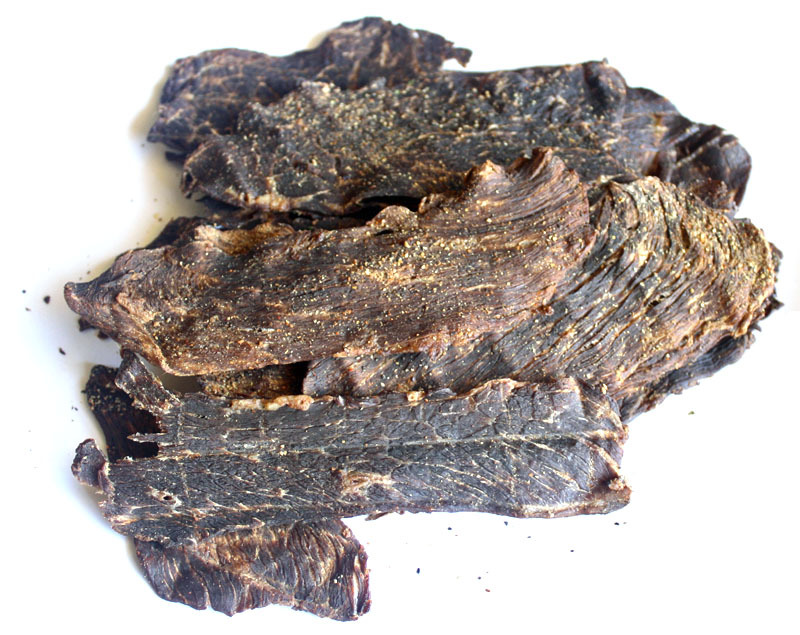 Mantell's Cowboy Caviar is a thin sliced, dry jerky made from 100% beef rump roast. According to Mantell, he originally made this jerky thin so that his dad could eat it with false teeth. The first flavor I pick up is the soy sauce and smokiness. The seasonings come in soon after, mainly a garlic with pepper and cayenne. The chewing brings on more of the soy sauce, but there's a light worcestershire noticeable too. The seasonings become more intense and more complex. The saltiness intensifies through the chewing, becoming quite strong. It tends to overshadow the other seasonings and marinades. The natural meat flavors are barely noticeable through the other ingredients, but they offer up the flavor of deli-sliced roast beef. As far as spiciness goes, there's a lot of seasoning intensity, but mostly as salt and soy sauce. But as far as heat is concerned, it's mild. 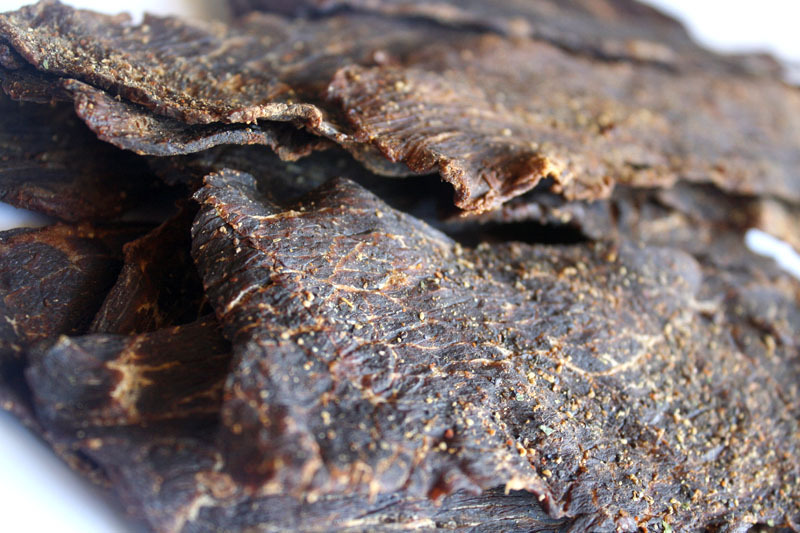 Overall, the flavors that define this jerky is largely a strong saltiness with a soy sauce flavor, and a noticeable smokiness. There's just touches of garlic, pepper, cayenne, and celery salt that help variate the seasoning. The meat consistency is thin slices of dry meat. It has a light crunchiness to it, but is still overall chewy, not crumbly, and easy to eat. Once chewed down soft, it feels like real pieces of steak cooked well-done. The meat is well marbleized, and there's some light stringiness, but otherwise free of gristle or other unchewable tissues. Verdict: Mantell's Cowboy Caviar generates a good deal of snackability for its ease of eating, that slight crunchiness, and steak-like chewing texture. The flavor is quite intense, mostly as salt and soy sauce, with a moderate smokiness, and you'll want something to drink to relieve the scorch. I personally find it too salty for my liking, but I really enjoy the meat consistency and chewing. It actually has a great flavor below that salt, mixes of garlic, celery, cayenne, smoke and worcestesrhire, but I'm having trouble enjoying it because my tongue is picking up too much of the salt.